Animaciones, ilustraciones, imágenes, y alguna que otra lectura. 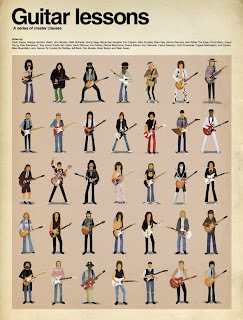 Frank Zappa, George Harrison, Slash, Jimi Hendrix, Keith Richards, Jimmy Page, Stevie Ray Vaughan, Eric Clapton, Mark Knopfler, Brian May, Johnny Ramone, Jack White, The Edge, Chuck Berry, Angus Young, Pete Townshend, Tony Iommi, Eddie Van Halen, David Gilmour, Ace Frehley, Ritchie Blackmore, Duane Allman, Kirk Hammett, Carlos Santana, John Frusciante, Yngwie Malmsteen, Kurt Cobain, Mike Bloomfield, Jerry Garcia, Ry Cooder, Bo Diddley, Jeff Beck, Tom Morello, Brian Setzer y Peter Green. Publicado por Alfil a las 9:46 p. m.
Buen blog, gracias por enseñarnos bellas imágenes. enero 27, 2010 11:53 p. m.